10:3: 10 on the omote; three on the ura. FWIW: For restoring, get washers (#0 and #0 with 0 width) at Microfasteners. Cheaper by far than eBay! Get 1/16 brass rod from local sources or eBay. A couple are all that would be needed. I got a C-Mon Blackie on eBay a short while ago - my main goal was to use it for honing practice. It was rusted a bit and the scales were chipped and warped slightly. However, once I got all the nicks out of the blade edge and sharpened it, I was quite surprised at how good a shaver it was. It was a Carl Monkhouse 'Blackie' and they have a good reputation. So... decided to clean it up a bit and put on some new scales. Since this was my first attempt at this, I had a couple of false starts but my basic idea was right and it took about 8 hours to complete the job (with about five trips to ACE for stuff). I got most of the ideas of how to make the scales from a YouTube video. Here is the restore. I couldn't get all the corrosion off without weakening the blade and throwing the spine out of alignment but did get the bulk of it. It has brass bearing washers on the inside. The pins are oversize because the hole in the blade was bigger than most - used 3/32" stuff instead of 1/16". The scales are made from red oak with tung oil finish. The spacer in the end of the scales is bamboo. Fit is excellent - "nuts on" as a guy on eBay brags about his restores. After I pasted the picture I noticed that the edge looks like it has jaggies - but that is just the result of shrinking the picture to fit here. I shaved with it a few times since this picture. It is a great shaver. 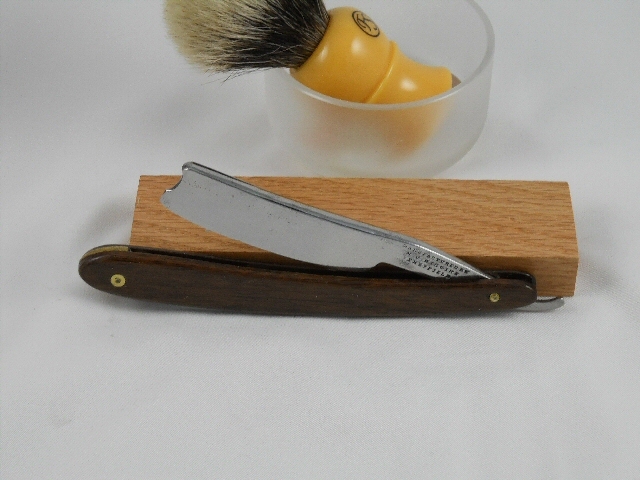 I gotta admit, shaving with my own restore was a nice feeling. I was smiling a bit as the shaver, taken back from the dead and completely rehoned and mounted, cut through a two day growth easily. Here is the original - the only photo so I should have been more careful. 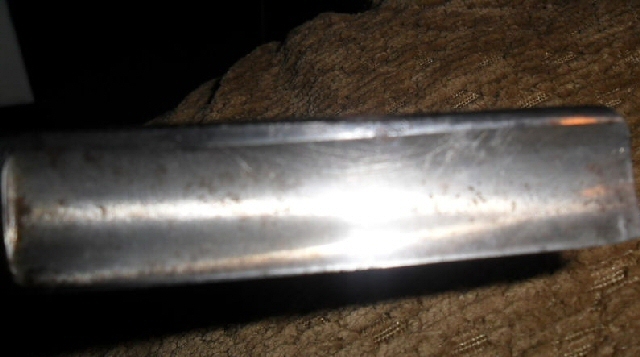 It was pretty severely rusted and the edge was chipped but the guy posted a fuzzy photo. The end spacer was damaged and the pins were corroded. 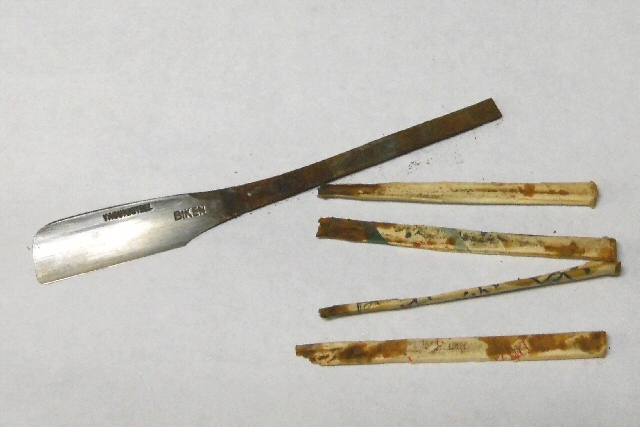 Rust had pitted the spine quite a bit but the blade part was recoverable. 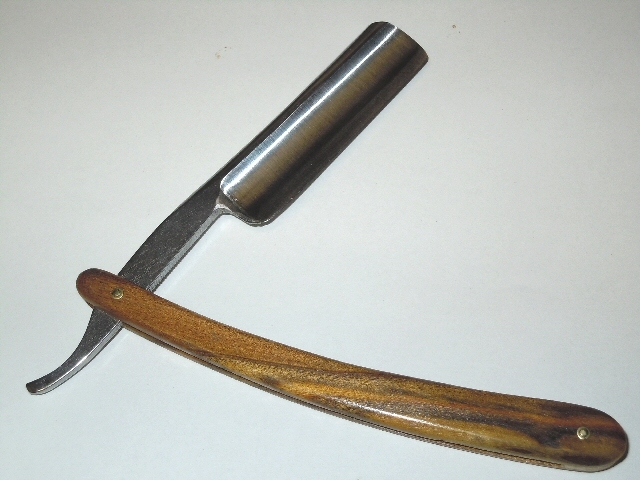 Below is the restored razor. Again, shrinking the size of the image causes jaggies that aren't on the original but here it is. I took the scales off and polished them and cleaned the rust off the blade and polished it. Repinned the scales. Couldn't get all the corrosion off without weakening the blade so went for 'good enough'. 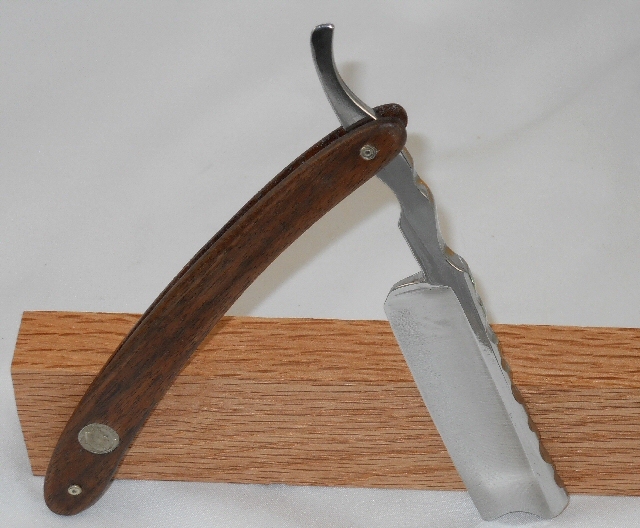 Bartmanns are great shavers and this one is no exception. This one was described as 'near mint'. Which was... wrong. 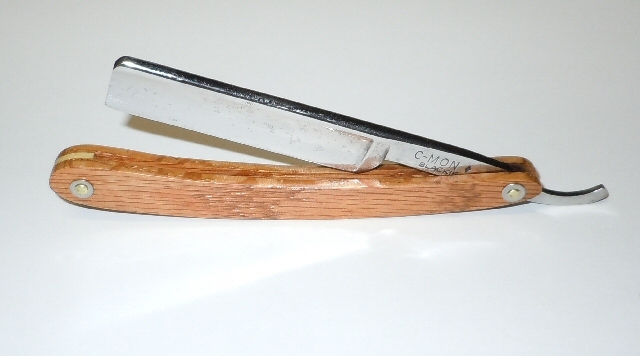 The blade was tarnished and the scales had scale rot (cracks and discoloration on the clear scales). In the first photo, you can see the eBay picture. The scales have gray splotches that are supposed to be metallic but they have tarnished over the years. Embedded in the plastic (? ), they are impossible to make look good. 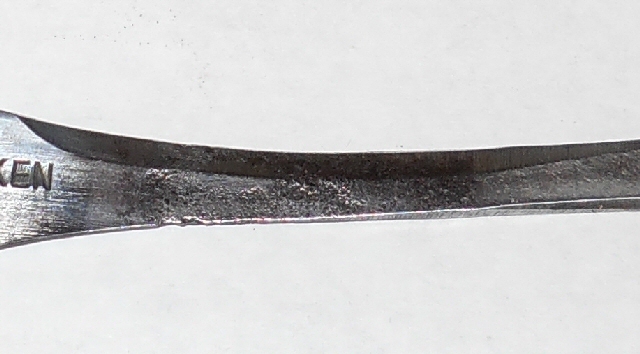 However, the blade had almost no hone marks. 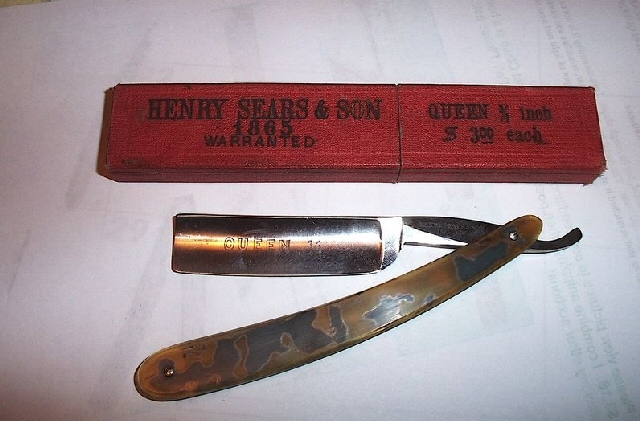 The blade is a nice example of a 3/4 Henry Sears and Son (1865?-1897). 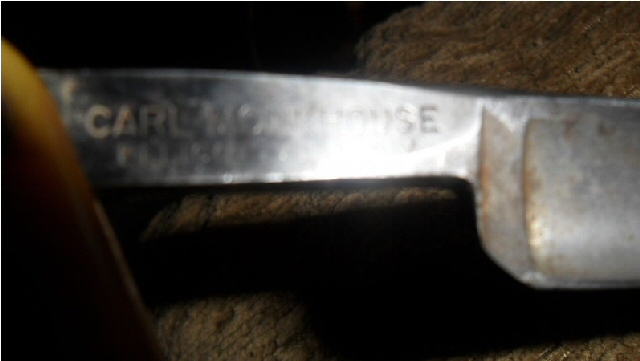 In the second picture is the restored item. The scales are walnut with Tung oil finish. I made them thinner than my first set with the C-Mon and rounded the edges more. Wedge, again, is bamboo. Bamboo looks better to me. This is an emotive subject! 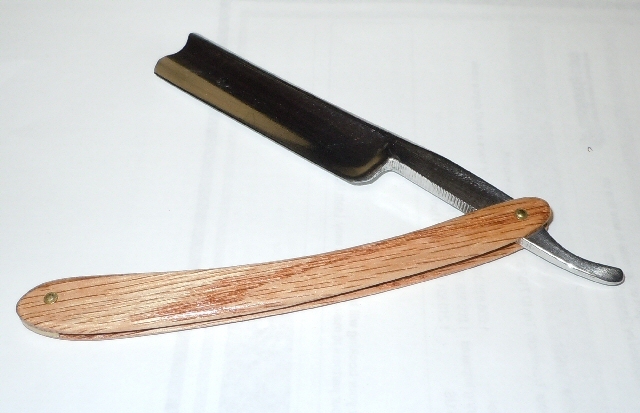 Look on some of the straight razor forums and see the arguments that break out. SRP has actually closed threads and banned users because of these discussions. 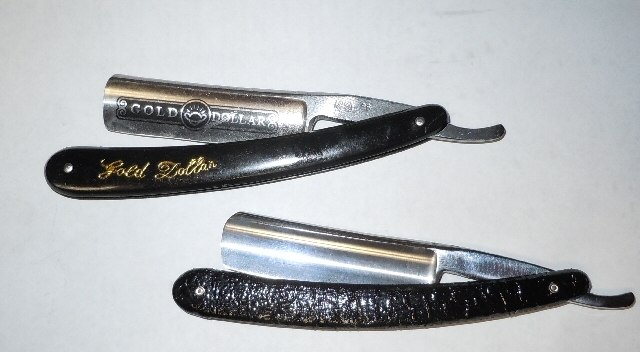 Most 'old heads' scoff at the Gold Dollar razors but a lot of new people - those with access to honing services - have found them very acceptable. I got 10 from China for less than $5 each - shipped! 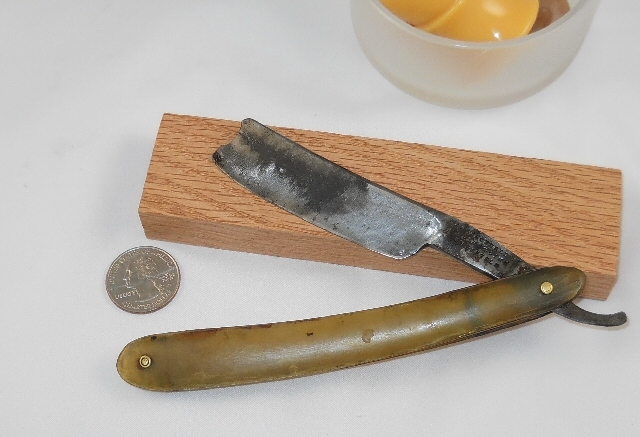 I honed and cleaned one up and it was a fantastic shaver - much better than some of my higher dollar and more vintage razors. I could name names. BTW: The blade is 13/16 - a lot of metal for $5. Did I mention that you have to hone them? I started with a 325 DMT and worked my way up. The bevel was set with a machine and it wasn't correct so I had to take some metal off. However, it quickly came into shape and when I shaved with it, it was a dream. 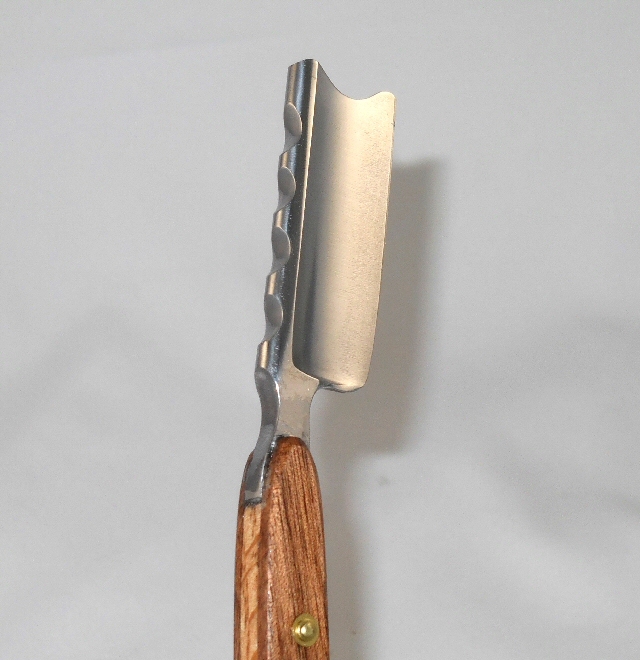 I also have a stainless version and it is also a great shaver. 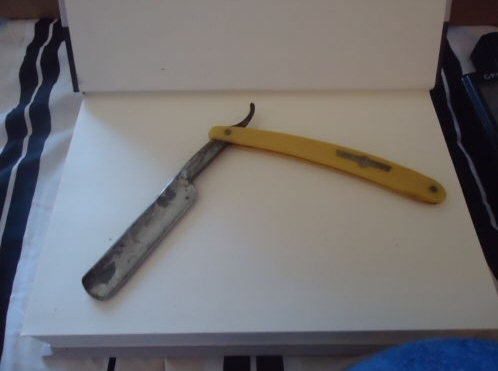 Anyway - I thought I might put a set of scales on one and take off the tooky silkscreened print on the blade. The following was the result. The first picture is of the original (from an eBay photo). The scales are ok, kinda rough and have a terrible insignia on them. The pins are probably stainless since the darn things are horrible to get off. I ground them down with a Dremel. The lacquer on the blade came off with a little acetone on a cloth. Here is the result. 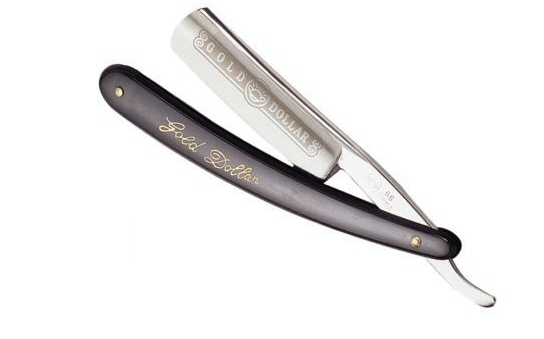 Quite frankly, it doesn't shave any better and the original scales would have held up. I just wanted to play. The wood is Staghorn Sumac. I used Tung oil - getting to like that since it makes a good finish that isn't easily marred. 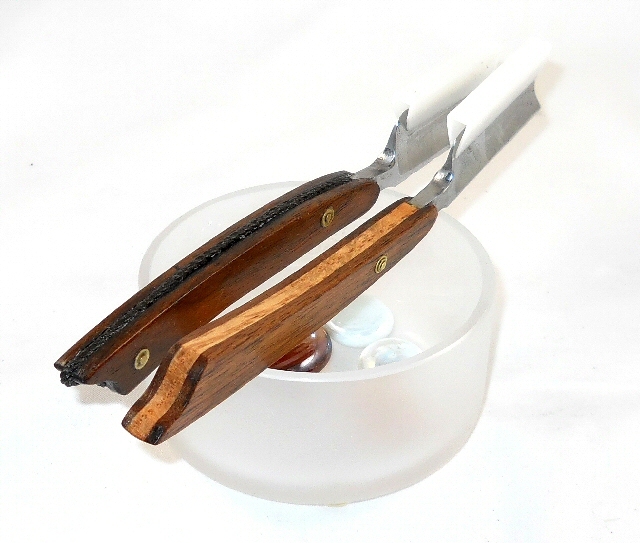 It isn't bright and fancy but it looks nice and serviceable on a straight razor. Here is another - same problem with the nose - used fungus marked Sugar Maple. Stabilized it with MinWax and coated with epoxy for strength. Here is another example of a simple GD modification. Took the scales off - using a Dremel cutoff tool and very carefully slicing the pins - being careful not to overheat the thing. The pins are extremely hard so it takes a bit of doing to get the scales off without frying them. Wiped the scales down with acetone and took off the insignia. Cleaned the blade with acetone and then, because I was being my normal obsessive self, took off the Chinalloy stamp. I then painted the scales with black polyurethane, let it dry a couple of hours, sprayed it with Krylon quick dry outdoor paint (black). The Krylon will turn into a crackle-like finish that ends up looking more like a faux hide or alligator skin (right... but it does look kinda neat and provides a nice gripping surface). Let that dry completely and coated it with two good coats of polyurethane (spray - don't brush it on unless you are careful - if you build up too much clear coat, the crackle will be diminished). Reassembled the whole thing. Put flat brass washers on the blade as bearing washers. 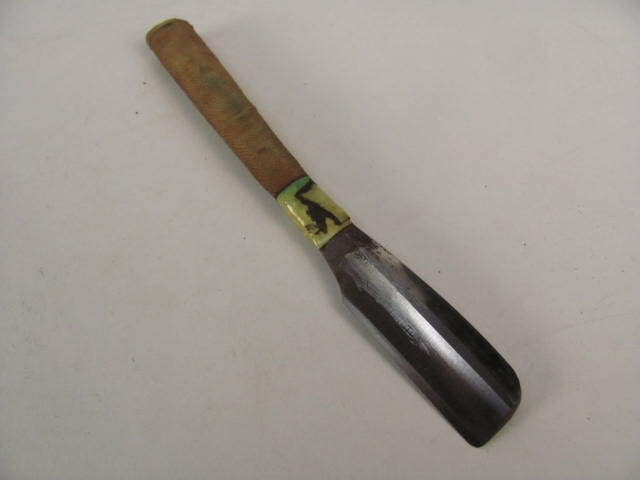 This is a very easy and cheap modification done with almost no tools (unless you count buffing out the stamp - which can be done with sandpaper and is still optional). The scales are fairly tough and the finish seems to stay with it. 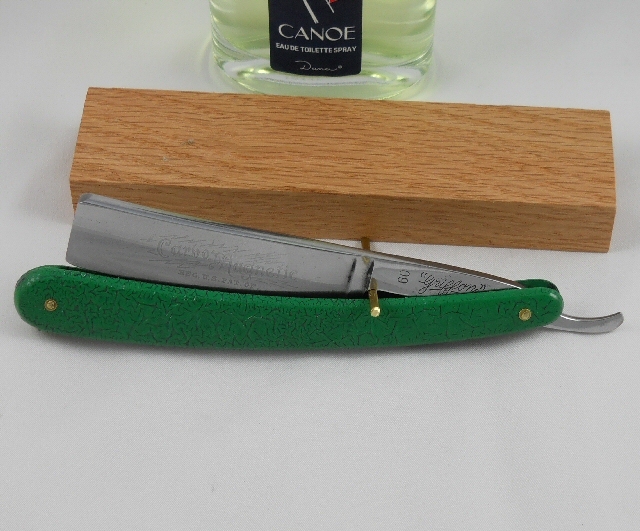 It makes the whole thing look and feel more like a straight razor. And, of course - there are the Kamisoris. Arrrrggghhh! Another obsession! I started to clean it and realized it was pretty rusty. The handle was padded with stiff paper and then string wrapped around it. Rust had infiltrated a bit. This is a Griffon #60. I broke the scales (by accident) so put on a set of GD scales that I had turned into a crackle finish. I got this MJ Higgins from a pawn shop. It was pretty beat but it was a near-wedge so there was plenty of metal to work with. It cleaned up fairly nicely. Scales are black walnut. Custom GD with a little spine and tang work - inset emblem is a 1/2 size dime.